I received my admission letter today! Even though I already know that I got in, I haven’t been able to stop myself from checking the mailbox several times a day. After picking up the letter from the post office together with Skjalg, we settled in at a cafe down the street. I sat out in the sun while Skjalg went in to get coffee. My nerves increased as I began opening the envelope. “What if it says that I DIDN’T get in?” I thought to myself. “What if she made a mistake when she wrote the email?” But there it was, that beautiful white piece of paper that makes or breaks all students – past, present, and future – and it was telling me that I did it! Please pay your tuition fee (according to the instructions in Appendix 1) and send the enclosed Declaration Form back no later than June 25, 2012. What!? I panicked. When was this sent?? I checked the date. The 8th?? It’s taken 12 days to get here! It was 15:00 on Wednesday the 20th. Banks in Norway close at 15:30, if not 15:00, and are closed on the weekends. 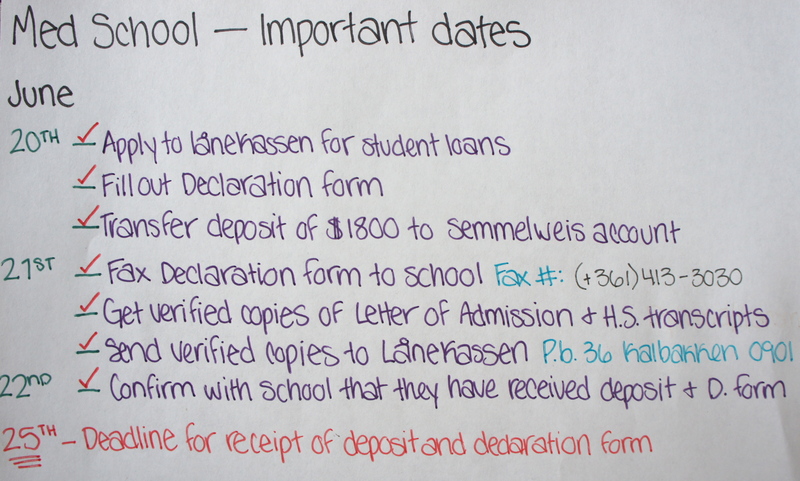 I would have but two days to pay the school, fax in my declaration form, and confirm my acceptance – meaning that I had to make a decision NOW. When we got our first round of admission letters in March, we were given about 5 weeks to confirm our acceptance. I understood that we wouldn’t have the same length of time this round, but I didn’t think that it would be so soon! When Skjalg came out with our coffees, I looked at him nervously and motioned for him to read that part of the letter. “Wow…” he said. “Well, that’s not a lot of time.” It’s been stressful enough with all this back and forth about Skjalg’s situation with school. He hadn’t even gotten his translated transcripts back yet! Yet here we were, at yet another hurdle. I knew I had to make a big decision, one that concerned only myself, since there was no way of knowing what the outcome would be for Skjalg. I stared off into the blank whiteness of the page. “Accept. It’s the best thing for you and you know that that is where you want to go,” he reassured me. “You’re going to Semmelweis baby.” I felt relieved. It’s an amazing feeling to be in a relationship with someone who knows you as well as, if not better than, you know yourself. I realized suddenly that I had made up my mind a long time before, possibly when I began studying for the second admission exam. It was always the case that if I got into Semmelweis, that is where I would go. Wonderful Bianca! Your deserve it. You got it! Believe me several of us who went through law school know what it means to wait months for that final message – I most of all. Go for it girl! Don’t let anything or anyone stop you from your dream. We are all behind you. Grandpa Antonio. I am from Germany and I am really interested in applying for the medicine and dentistry study programs. I had several questions referring to the entrance exam, procedures, chances, tuition fees and etc. I hope you can answer all of my questions since it is very important to me and I really want to get into one of the Hungarian universities , but most preferably into the Semmelweis university. How hard is the entrance exam in reality ? I am intending on taking part in the exam in June in Stockholm although I wanted to participate in the entrance exam in March, but since I had another entry exam which was really close to that first date, (entrance exam in Bulgaria), I really had to chose between one of them. As I have already sent in all my documents and my application package to Bulgaria I decided on first taking the entrance exam there and for the moment leave out the exam in Stockholm. Was that a wrong decision? The representative in Stockholm told me that I had lost on the chance to be invited to a retake exam in case if needed. Is that true? I mean, even if I really need another retake I could take the retake at another location on another date (e.g. Budapest, Greece etc.) or not? What would you say about my chances on getting admitted into the study program although it is a quite late date? The representative told me that it doesn’t matter if I had applied in March or if I am going to take part in the exam in June because the chances are still the same. Can you confirm that? Does it make a difference if I apply for all three universities or if I only focus on Semmelweis and Szeged? The thing is that I badly want to get into Semmelweis or into Szeged although Semmelweis is my primary preference. The representative kind of answered that question to me like that: If I want to avoid Pécs I should definitely leave out Pécs for the application and only apply for Budapest and Szeged. Through that I definitely would get in either one of the universities. But if I apply for Pécs too they would rather put me into that university because Pécs apparently admits more people than their capacity allows them to take and therefore it is allegedly easier to get into Pécs than into the other universities. Is that true or does each university evaluate the results of the written exam separately or on their own independent of the other universities? So is my acceptance to Semmelweis and Szeged only dependent on my results in Chemistry and Biology or is it rather dependent on the amount of other optional universities I apply for. What topics in Biology and Chemistry should I rather focus on referring to the oral exam? I am kind of confused and don’t know which topics to concentrate more on when it comes to the oral exam? Metabolism, Citrate-Cycle, Cardiovascular System, Respiratory System, Cell Membrane, Carbohydrates, Inorganic or Organic Chemistry ……? My next question would be: How long do you have time to pay the tuition fee and do you have to pay it all at once or do you first have to pay a certain deposit beforehand in order to keep the place? Would you prefer an earlier entrance exam date or should I keep to that one because in Stockholm the fees seem to be the most reasonable. I am studying now since November for the exam and I come from a more natural science background and almost have studied all of the mentioned topics in the syllabus but do you think I have good chances with that long period of studying and the knowledge I already I have from my presemester in medicine and my two studied semesters in biomedical chemistry? I have read and heard in several forums and from some people that the entrance exam is pretty easy and not that hard. Can you say that this is correct or not? I know, these are a lot of questions and I hope you don’t get annoyed or even bored by that quantity of questions but you most probably know how it feels like if you really want to get into a medical school and you are still insecure about certain points and things. So I am sorry in advance if I take your time but your answers would definitely calm me down and probably bring the feeling of relaxation back into my mind. I will do my best to answer your questions 🙂 I’ll only be able to answer from personal experience, so there may be some questions that are better answered by official parties, like the English Secretariat at Semmelweis or the representatives helping to process your applications. It seems like you have a solid background in the entrance exam topics, so it shouldn’t be a problem for you. On my resources page, I have uploaded some sample entrance exams and review manuals. If you browse through those, you should get an idea of where you stand material-wise. It is really up to you about when to take the exam. You may get in on the first try, but in case you don’t, it’s nice to have a second shot. I’m not sure what the representative meant when she said that you lost the chance to be invited to take the retake exam, unless she was just referring to you retaking it in June. I took it first in March, and then retook it in June. If you look in my blog posts under “entrance exam” you can find a post where I’ve written about my oral exam. I think the June dates are among the last dates for the entrance exams, so you should check where they are offered and when. You may not need a second try, but it’s always good to have a plan B. I think the chances of getting in are the same in March and June. They usually take in a lot of students and then the numbers thin out over the semesters. I think we are down 100-120 people from when we started. I have no idea about the “applying for all three universities at the same time” thing. We heard that rumor too, but then Skjalg (my boyfriend) applied to all three and got in to all three and I got in to both Pecs and Semmelweis in the same round. I don’t think the schools are connected enough to make decisions like that. Your oral interview will be with a professor from one of the three schools though, so they may have more influence at their school than the others. Other than that, I think the schools process the exam results independently. I don’t know if they know which other universities you apply to. I doubt it, since you send separate applications to each of the schools. Honestly, I wouldn’t worry about it. You should apply where you want to go. If they want you, they will accept your application. As I said earlier, I can only speak from personal experience. The oral exam can vary so much, so I unfortunately can’t give you a clear answer on that. It is really more of an interview than an exam. They want to get a feeling for who you are and then want to gage how much you know. My friend Jannie was told to just talk about her favorite subject in medicine. Her dad is a cardiothoracic surgeon, so she pretty much talked about the heart for 5-10 minutes and that was it. For guaranteed accurate answers to your tuition questions, I recommend you contact the English Secretariat. I think we had to pay a nonrefundable deposit of $800 by the deadline and the tuition was due before registration in the beginning of September. I know the entrance exam is intimidating, but shouldn’t be difficult if you have a strong background in biology/chemistry. If you’ve been studying since November, you should be plenty prepared. You should just go for whatever you feel is best for you. it helped me a lot and gave me a great insight into the whole procedure. Can I apply for both, medicine and dentistry? Because as far as I know it is possible. Did you also apply to all three universities or only to Szeged and Semmelweis? Do voluntary work, letters of recommendation and preparatory courses support my application? Is it really hard to complete or manage respectively the preclinical phase in the first 4 semesters or do you need longer? That were actually all my questions. No problem 🙂 I’m happy I could help to clear a few things up. I think it’s possible, but I would choose one or the other just because the application is expensive. The curriculums are pretty much the same for the first year and I’ve heard of some people switching. In the first round, I applied to all three (was accepted to pre-med programs at Pécs in Szeged). In the second, only to Pécs and Semmelweis (and accepted to both). I want to be able to work in California (where my family is) and California doesn’t recognize Szeged. The first two years are very, very tough, but not impossible. This is not an easy degree and many are not ready for just how demanding it is. Exam periods are the worst, poor planning or just a string of bad exams has claimed many. We’ve made it through fine so far, but now we’re gearing up for the biggest challenge yet: the second-year final exams (finals exams in everything we’ve studied in anatomy, physiology and biochemistry). When we started, I think we were around 320-340 and now I think we are 180 registered this semester (and I don’t know how many of those need to retake classes ). Correction: Can I apply for both study programs at the same time to the same university? I wrote to you before about my entrance exam, I got accepted by first try!! 🙂 But now I am so scared of a lot of things, moving so far away, and also that the studies are so hard! I have studied pharmacy for 2 years so I think I have a good base for medical studies, but from what I read from your blog, you need to study so much that you kinda don’t have time for anything else! Do you have time christmas break and summer holiday at all the first years? I am so scared of not passing the exams, (especially the physics in the beginning of the program, I am so bad at physics!) because as I am from Sweden I need to pay for my school by myself, and I can’t afford to redo any year. How do you cope with everything? 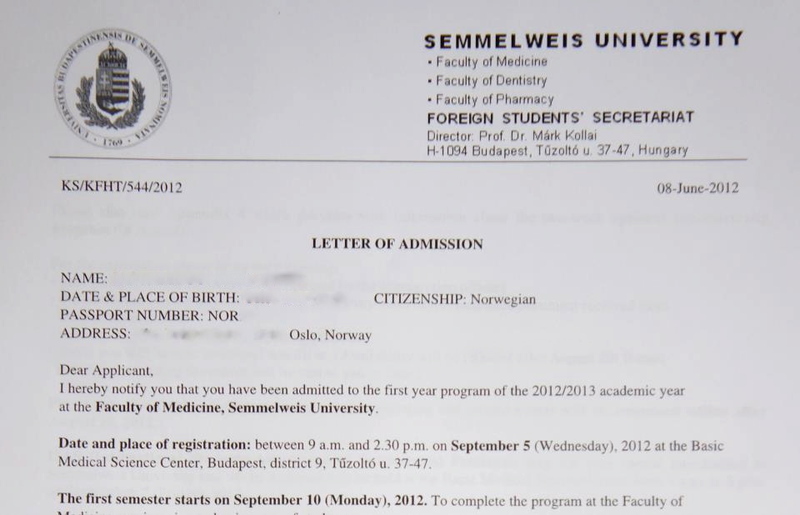 Is there any chanse to transfer to a norwegian, danish or Swedish school after some years at semmelweis? Do people do that? I would love to go but right now I am pretty freaked out about how hard everything seems, so I am wondering if Poland, Gdansk, might be easier for me than semmelweis. Why did you choose Semmelweis between all the easter europe medical schools? Sorry for a bit of a messy question, I just want to talk to someone who studies there 🙂 Thank you! I’m sorry it’s taken me a few days to write back, it’s been a little crazy with studying here! I can read some Swedish 😉 if there is anything I don’t know, I can always ask my friend Jannie (she’s from Stockholm). Congratulations on getting accepted!! Great job!! I know that feeling exactly – the relief and excitement of getting accepted and then the flood of anxiety that follows. The studies are hard, yes, but not impossible. Plus, with you having taken pharmacy for two years, you might be able to get exemption from some of the classes, which would make it much easier for you. People are very, very different with their study techniques here, but generally, yes, you study all the time – even more than a full-time job. There are some people who are able to go out a lot and just cram last minute, but I am not one of them. We fit in time for some nights off for a movie, working out and some fun, but studying is really the number one thing we do. As we’ve been told by students in upper years, these first two years are the worst. Exam period starts immediately after the last week of school and then continues for 6 weeks. The amount of break you get depends on how you plan your exams and whether or not you pass them. The winter exam period goes from about Dec. 18th until the first week of February. Some people go home for Christmas, but it is very individual. I never feel like I can take a break until I am done, so I always make sure I finish my exams first. You never know if you are going to need more time, so it is better to get them out of the way. You will have 3 chances to pass each exam and a 4th extra chance if you get permission from the head of the department. Some people are amazing and able to finish all the exams by New Year’s, so they get a month off, whereas others might only get two days off before the new semester. Summer exam period runs from about May 17th until July 4th and school starts in the first week of September. You will have to do various practices though during the summer. Before third year, you have to do nursing practice for at least 180 hours. I took the first summer off, so I will be doing my nursing practice this summer. I understand it can be scary, but you can honestly never really know how it is going to go until you try. I know it’s harder since you have to pay for it yourself, but if this is what you want to do, then you should go for it. You will only know how it will be if you experience it for yourself. I feel scared all the time that things aren’t going to go well, I think everyone here does, but I know that this is what I want to do and remind myself that everything will work out. In the beginning of the very first semester, I felt like everything was so difficult. I also struggled with physics in school, so I was so nervous about how it was going to go here. But as long as you study hard and change your studying style when it doesn’t work out, it should go well. When it comes to transferring, I’ve heard that you can’t transfer to Norway, but that it is possible to transfer to Sweden or Denmark if you have enough credits. I think that when you transfer to Sweden, you have to do an extra year, but I’m not sure. I only had 10 days between when I first found out I could apply and my entrance exam, so I only looked at the schools offered by the program I applied through in Norway, which were in Czech Republic, Slovakia and Hungary. After looking through the different schools, I just felt that Hungary was the best for me and that Semmelweis was the best option out of the three schools there (the others being Pécs and Szeged). thanks again for all your support and helpful advices. I am studying like a freak at the moment and the exam is coming up this saturday. I am getting more and more excited every day. I don’t know if that is kind of contraproductive but I just want to get into at least one of the medical universities. However there are still some questions left which I wanted to ask you if that is no problem to you. I am kind of insecure right now because as you can imagine I couldn’t manage to study all the required topics , to be more specific : embryology, skeletal system. biosynthesis of the organic compounds. There is still some time left but I need that time to review a bit of my chemistry stuff. I don’t know what your opinion is on that but how deeply should I go into stuff like biosynthesis of the organic compounds, cellular respiration and vitamins. Do you think that I need to know all the intermediates or that a basic overview of the most important results of these reactions and their essential products is more relevant? At the moment I am giving me a real hard time because I try to study as hard as I can. I don’t know if that has anything to say but In the sample test I scored in average between 15 to 16 point out of 20 in both chemistry and biology. Is that a good result and a good indicator or shouldn’t I be that much of relaxed about that. Do you think I should rather revise the old stuff ( which I am doing at the moment , at the same time I am studying some new topics) or do you think that I should just focus on revising the things? As I said: Embryology , skeletal system and biosynthesis and Vitamins are kind of missing. Do I also have to know all the structural formulas of the amino acids or vitamins or just the most important ones? i am really sorry that I am overloading you with questions but I just need someone to tell me that I am doing just fine and not need to worry. I just really want get into one of the three medical schools. It sounds like you are doing great 🙂 Keep that excitement fueled. I wish you the best of luck! To add: he asked me to draw the structure of glucose in my oral exam. I only knew that it had six carbons and that carbohydrates have H and O in their side groups, so I just started drawing a bunch on OH groups (he obviously stopped me when I reached 5/6 of them). For cellular respiration, know the basics (glycolysis yields pyruvate from glucose, which can be converted to lactate or enter the TCA cycle and yield CO2 and ATP etc). You’ll learn all the intermediates and regulation during biochem second year. You are currently reading Semmelweiss Admission Letter at Buda-B.